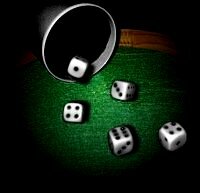 Why play yahtzee at freethedice.com? freethedice.com is a very popular online yahtzee game community, founded in September 2006 by three administrators, Kal, inqov and Mary. I am very happy to be able to say that our small community has become a daily hangout for many people who enjoy yahtzee. The games here are free and always will be, although we do have a dice shop containing different coloured dice and animated dice to brighten up your gaming experience. Our major goal was to create a games site that focuses on playing games and having fun and to create an atmosphere where people chat whilst playing. Our games website is entirely browser-based so there is no download required. The site has various forms of multiplayer or solo yahtzee games: painted/rainbow, triple, regular yahtzee and many other rule sets that were devised by the players, which leads me to the next point. This is more than just a games website, this is a real community where people spend a lot of time chatting and having fun during their games. Some play just for fun, to chat, others are more competitive and enter some of our daily automated tournaments. Freethedice.com was actually founded back in 2006 as a challenge: "can you make a place where we can play a game where there are no cheaters, no power gamers or abusive people?" Since then, more than 80,000 players have registered over the years and enjoyed playing yahtzee with their friends, families and new acquaintances. Why not take a peek inside our site and register now for free, to get started and start playing yahtzee today with some great people? Is Yahtzee a game of blind chance? Some people suggest that there is no skill in the game of Yahtzee. It is true that the game has a huge element of luck, it is not only luck, there is also a lot of decision-making that goes on. I like to think of it as a game of luck management. It is really up to the player to make the right choices at the right times to maximise his or her chance of either scoring as many points as possible or of winning the game. And even then, there is a difference between strategies. The types of decisions made to give yourself the chance of the highest possible score for a single game are very different to the kinds of decisions you will make to try to get the best average score. I remember playing a tournament game where I was losing by over one hundred points with two turns left, but I had yahtzee and high straight open. With a low straight already on the table, I ignored it and went for a yahtzee as it was my only hope to win the game. A ridiculous decision, but I did manage to score two yahtzees, 140 points and won the game! So, for me, yahtzee is a game of luck management and decision-making. Of course, there are times when the dice decide you will lose the game and those times can be very frustrating and that's when it is good to enjoy chatting with your opponents! Over the years so many people have formed strong friendships through our website. There have been cases of people here at freethedice.com enjoying each other's conversation and sense of humour so much that eventually they have met, sometimes individually and sometimes in groups. I am very happy that a simple games site can bring people together sometimes. In at least one case, it led to marriage! Many other times, people tend to play yahtzee with their family or friends from a distance, just as a nice, fun activity to do together whilst chatting online. It is probably no coincidence, that the founder of the game, formerly called The Yacht Game, originally invented the rules so that he and his family would have something to do whilst at sea, on their yacht. It is also no coincidence that some 40-50 years later, his game is still very popular as a social activity and brings people together, either for the first time, or to keep people together.